Tag Line: Can love really heal all things? Summary: Can love really heal all things? If Sam Carroll hadn’t shown up, she might have been able to get to her mother in time. Instead, Allie Everly finds herself at a funeral, mourning the loss of her beloved mother. She is dealt another blow when, a few hours later, she is sent from Tennessee to Maine to become the daughter of Miss Beatrice Lovell, a prim woman with a faith Allie cannot accept. Poetry and letters written to her mother become the only things keeping Allie’s heart from hardening completely. But then Sam arrives for the summer, and with him comes many confusing emotions, both toward him and the people around her. As World War II looms, Allie will be forced to decide whether hanging on to the past is worth losing her chance to be loved. What I Loved: While I usually try to stay as far away as I can from reading Historical Fiction (because I'm not too crazy about modern Historical/Romance Fiction) I found Interrupted to be a lovely read that might have just changed my mind. Interrupted is a truly beautiful story of loss, grief, life, faith and love found. It made me teary eyed. It made me laugh. It made me feel...strongly, desperately and passionately alongside Alcyone "Allie" Everly with every turn of the page. I was so saddened when Allie's momma finally passed away, after she had had to watch her momma slip slowly away; and it was a blessing to have read this novel when I did. I was away on Spring Break when I started reading Interrupted and I had to drive back to my hometown to see my Mimi (grandmother) for the last time before she passed away (a week thereafter I attended my Mimi's funeral service.) Reading through Allie's story of grief and loss sort of held me together along the way, as silly as that seems to say. Moving on. The characters were absolutely what MADE the story for me! I adored Sam Carroll. He never gave up on Allie. He loved her always, right where she was at. He was sincerely clever and humorous. He always had this bright hope and faith about him too, which was quite charming. I loved watching his relationship with Allie grow and bloom throughout the years in the story. I grew to love Allie Everly over time. Honestly, I hated how mean she was to Sam when they were both younger. But how could you dislike her forever when she was authentic, passionate and driven to stand beside her momma, even in death? The story really started to grip me when Allie had her life completely flipped upside down. It was when Allie moved from Tennessee to Maine that the trials and her true character were borne, and that, for me, was what really drove the story. I loved that music...and the piano...meant so much to her, because music and everything piano means so much to me also. Oh, and words too! I loved that two things that the author is really passionate about, writing and piano, were interwoven into the character of Alcyone Everly in a completely unique and loving way. I was head over heels in love with Miss Beatrice. She always, authentically, showed Allie what love and faith looked like even if Allie didn't want any part of it, because of the feelings her momma had transferred onto her about faith and God. I pretty much laughed every time Miss Beatrice got all silly and slipped into using her "Beatrice-isms" in conversation with Allie. I loved the secondary characters, which didn't really feel all that secondary to me, and I also adored the historical time frame. I'm recommending this book... If you are interested in looking more into a stellar debut author, YA Historical Fiction and a story about grief, life, love and ultimately faith then you should definitely give this novel a read! 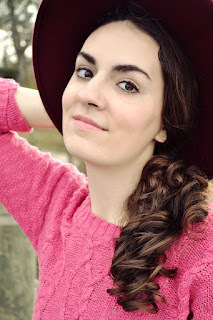 About The Author: Rachel Coker resides in Virginia with her parents and two sisters. She has a passion for great books, and has been surrounded by them all her life. Her gift for writing became apparent at the age of eleven, at which time her parents signed her up for a year of lessons with a professional writing coach. Rachel also has a deep love for classical music and old black-and-white movies. When she is not writing or playing the piano, Rachel enjoys spending time with her family and friends and serving her Lord and Savior. 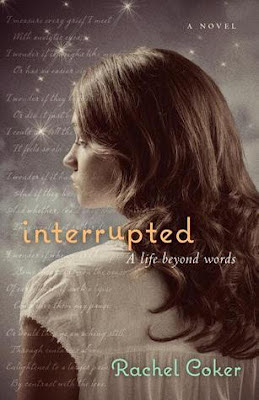 Also, check out these other Team Novel Teen bloggers to see what they had to say about Rachel Coker's Interrupted: A Life Beyond Words. Team Novel Teen is a group of bloggers dedicated to spreading the word about clean teen fiction. Check out other posts about Interrupted by Rachel Coker by clicking on the links above, and check out www.NovelTeen.com for more information about Team Novel Teen. Thanks, Gillian! And yes, yes they were. This book looks interesting! Thank you for the review of it! It is QUITE INTERESTING, Jemimimah. ;-) Thanks for finding me on Goodreads! Yay! I'm so glad you got the chance to read Interrupted too, Sierra. As you mentioned, it was interesting how the author's interests were integrated into the story. I can only play a bit of piano myself but I write a lot so I could identify with Allie's dream of wanting to have a book published. Fun review!! :-D I agree with you all over the place, especially how the supporting cast is very alive and vibrant! Oh, Sarah, you write book reviews like some people write poetry. I loved savoring every word and nodding my head along. :) Sam = *swoon* Allie = definitely felt like shaking her a few times for how mean and dense she could be. Miss Beatrice = got on my nerves sometimes, but she sure was a patient woman, and, I think, the perfect second mother for Allie. Poetic book reviews, eh? I'll take it! haha Yes, Miss Beatrice was a little overly silly at times (even for me), but she didn't cause me to laugh on more than one occasion. It was amazing how when I started reading Interrupted my Mimi was slowly slipping away and I had traveled to see her, and if I recall correctly I'm pretty sure that I finished reading Interrupted the day before my Mimi passed away. Yes, I suppose that the level of romance was based on Rachel's personal preference too. But it did feel more like a "handshake" to me than a "cemented relationship." Like I said that was the just about the only thing I didn't like so much, but the ending worked just swell enough to satisfy me. At least Sam came back! And yes, I believe someone like Sam would've kissed her like there was no tomorrow; and she never told him not to.